The Oshawa Generals defeated the division rival Peterborough Petes a second time on the weekend, closing out a perfect 3-0 set as Florida Panthers prospect Serron Noel (8, 9) scored a pair of goals. Tyler Tullio (1) and Cole Resnick (1) each scored their first OHL goal as the Generals outshot the Petes 34-29, improving to 6-4-1-0. Boston Bruins prospect Kyle Keyser picked up the win in goal with a 28-save effort, surrendering the lone Peterborough goal off the stick of Brady Hinz (6). The Petes lose their third straight and fall to 8-5-0-0. The Erie Otters closed out a perfect 3-0 weekend, defeating the visiting Windsor Spitfires 4-3 in a shootout. Danial Singer (2) tied things midway through the third period to force overtime before he and Gera Poddubnyi scored shootout goals. The Spitfires put a puck into their own goal on a delayed penalty to open the scoring that was credited to Petr Cajka (2). Joseph Mack (2) also found the back of the net while goaltender Daniel Murphy made 23 saves. Will Cuylle (3), Luke Kutkevicius (4) and Kyle McDonald (2) scored Windsor goals while Cody Morgan provided their lone shootout tally. The Otters improve to 4-6-1-0 while Windsor earns a point but falls to 5-6-0-1. 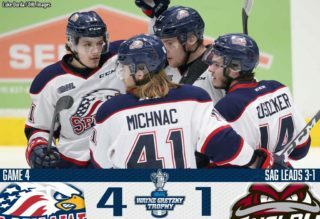 Arizona Coyotes prospect Nate Schnarr (7, 8) scored twice, netting the game winner 35 seconds into the second period as the Guelph Storm defeated the Kitchener Rangers 5-2 on home ice. The Storm responded from back-to-back losses to beat the Rangers, who they lost to on Friday, as Isaac Ratcliffe (8, 9) and Owen Lalonde (1) also provided goals. Storm netminder Anthony Popovich stopped 31 of the 33 shots he faced while Jonathan Yantsis (8) and Rickard Hugg (8) provided Kitchener goals. Guelph outshot Kitchener 42-33, going 2-for-5 on the power play. The Storm reclaim first place in the Midwest Division with a 7-4-1-0 record. Kitchener falls to 6-4-2-0. An offensive breakout in North Bay saw the Battalion and Frontenacs combine for eight first period goals as Troops captain Justin Brazeau (10, 11, 12) tied a franchise record with seven points in an 8-3 win. Brazeau tacked on four assists while linemate Matthew Struthers (7, 8) registered a career-high six points. Egor Postnov (1), Adam McMaster (6) and Brad Chenier (4) added singles while goaltender Christian Purboo made 28 saves. The Battalion went 3-for-6 on the power play, holding the Frontenacs to 0-for-6 on the day. Brett Neumann (7, 8) scored twice for Kingston while Ryan Cranford (2) also found the back of the net. The Battalion climbs to 5-7-0-0 while Kingston suffers a fourth straight loss, falling to 3-9-1-0. 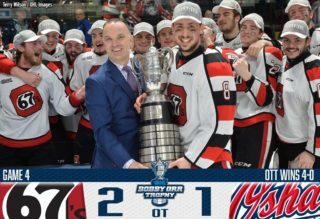 The Ottawa 67’s picked up their seventh win in the past eight games, defeating the Mississauga Steelheads 3-1 on the road to snap their three-game winning streak. 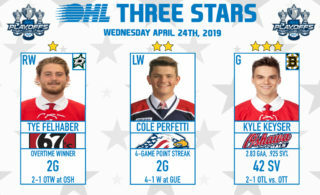 The trio of Tye Felhaber (14, 15), Marco Rossi (9) and Austen Keating contributed all three goals, with Felhaber pulling into the OHL goal-scoring lead as he netted the 100th of his career in the process. Rossi scored the game winner 7:19 into the second period and added two assists, going 10-for-13 in the faceoff circle. 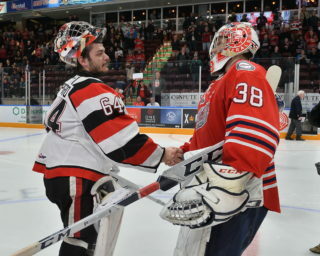 Cedrick Andree stopped 31 of 32 shots, surrendering Mississauga’s lone goal off the stick of Ryan McLeod (2). Jacob Ingham made 29 saves in the Steelheads loss as the Trout fall to 8-3-1-0. Ottawa leads the East Division by five points with a 10-3-1-0 record. Joseph Raaymakers stopped 36 of 38, guiding the London Knights to a 4-2 road win in Sarnia. Dalton Duhart (2), Cole Tymkin (6), Josh Nelson (2) and Billy Moskal (3) scored London goals while Chicago Blackhawks prospect Adam Boqvist recorded a pair of assists. Sarnia outshot London 38-22 as Mitch Eliot (2) and Hugo Leufvenius (5) scored goals and captain Ryan McGregor had two assists. The Knights respond from a three-game slide with consecutive victories, improving to 6-4-1-0. The loss is Sarnia’s third straight as they fall to 4-6-1-0. The Flint Firebirds led 3-2 after two, but the Barrie Colts charged back for a 6-4 win on the road as Ben Hawerchuk (8, 9) and Jaden Peca (2, 3) each scored twice. The Colts outshot the Firebirds 39-27 as Ryan Suzuki (5) and Nathan Allensen (1) also had markers while Jason Willms and Justin Murray both recorded two assists. Kyle Harris (1), Jake Durham (2), Ty Dellandrea (3) and Jacob Winterton (4) scored Flint goals as the Firebirds fell to 0-11-0-0. The Colts are now 7-5-1-0.